Managers can choose to send a message to “Everyone” which means all managers and employees. To send a message to Everyone, choose that option in the “To” dropdown. 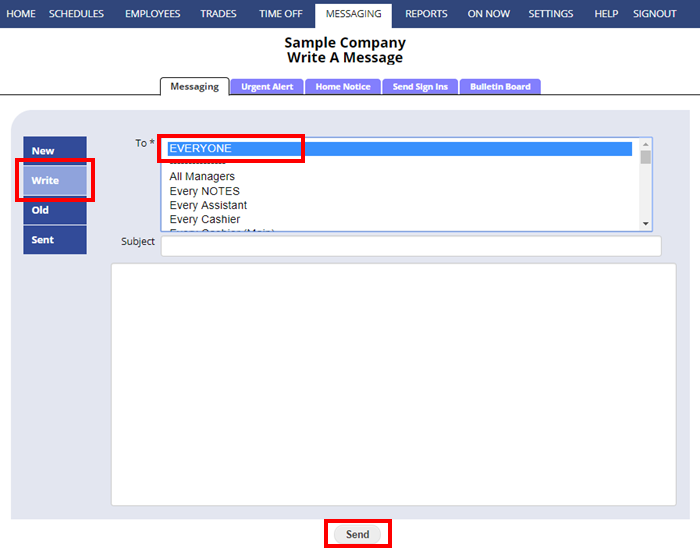 Or messages can be sent to various groups by adding a position and setting employees to that position. The in the MESSAGING “To” section, choose that Position. Note that employees CANNOT send a message to Everyone, they may only write messages to one manager or employee at a time. This is to prevent our database from being clogged with unnecessary messages and forwards. You can allow employees to post bulletins to the Bulletin Board to communicate with everyone.